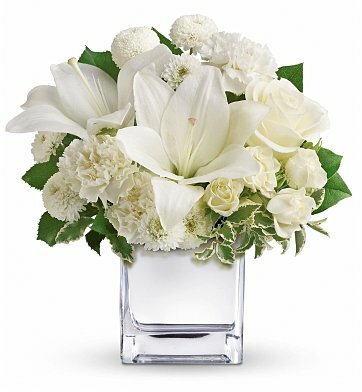 Serene and elegant as a winter snowfall, this collection of white roses, asiatic lilies, carnations and chrysanthemums in a mirrored cube vase brings a sense of rest and peace in the midst of the holiday bustle. Assorted Lush Greenery, and more. Standard Arrangement Measures 11" x 11". Peace on Earth Bouquet is a hand delivered gift. These gifts are delivered by one of our local design centers located throughout the United States and Canada. Same day delivery is available for most gifts when ordered before the cutoff time. The cutoff time for Peace on Earth Bouquet is 12 PM in the recipient's time zone. I sent the flowers to my grandparents and they loved them! As you can see by the title, this is what I thought about the bouquets. Excellent service. Flowers were beautiful!! Very timely delivery. Appreciated the status updates. I sent this from out of state to a friend who's pet died. She said the flowers were absolutely beautiful and none were squished. Since we are in California, we have not seen the flowers. However, our friend appreciated the flowers very much and thanked us over the telephone, saying they were beautiful. I was so happy to find your site. I needed a last minute birthday gift for a grandmother. Within minutes I found the perfect bouquet within our budget. The ordering process was effortless and took only seconds! Thank you. Although I didn't see the bouquet, she was so happy and thanked us for the "beautiful and pristine" flowers. Ordering flowers online can be risky and takes some trust because we don't always see them. I feel so confident after this experience with you, I will definitely order again! Thanks again! Was delivered as promised and recipient was quite pleased. Said it was beautiful. Would order again.